The Arcadia High School football team landed another big transfer after freshman quarterback CJ Montes transferred from La Salle. He enrolled at Arcadia Tuesday, his family confirmed. Montes started most of the Lancers’ games last season at quarterback and showed flashes of what he might become with his athleticism and big arm. The 6-foot quarterback is already getting feelers from Division 1 colleges and the move to Arcadia should immediately make the Apaches contenders in whatever Division it plays in this fall, which could be Division 11, where it advanced to the second round this past season, or Division 10 after finishing, 8-4. Montes joined La Salle teammate Chris Wilson, a sophomore who battled Montes for the quarterback position last summer. Wilson also transferred to Arcadia weeks ago, and is believed to be changing positions. Speculation is that Wilson is likely to play linebacker. Montes and Wilson could be just the beginning of players leaving La Salle after the departure of coach Russell Gordon, who parted ways with the school a couple weeks ago. Arcadia coach Andrew Policky also confirmed recently that three Cathedral football players transferred to Arcadia, two of which are receivers that should benefit Montes right away, should he win the starting position. Montes has a good shot after the departure of senior quarterback Max Davila, who threw for 1,957 touchdowns and 22 touchdowns. The Cathedral transfers are juniors Jabari Kindle, Ahmad Lipscomb and Dyllan Wright. Kindle is an Angleus League first selection at wide receiver. He caught 43 passes for 561 yards and four touchdowns. Lipscome, an Angelus first teamer, recently received his first offer from Seton Hall University. He caught 39 passes for 503 yards with seven touchdowns. Wright played sporadically in nine games last year for the Phantoms, catching six passes for 90 yards. When you couple that with the return of Star-News Offensive Player of the Year Rolandiss Whitener, who will be one of the best all-purpose threats in the San Gabriel Valley area next season, skies the limit for the Apaches. Montes already is sort of a mini celebrity. After being featured with Snoop Dogg during an American Online documentary piece last fall, he also received a shout out from Lakers legend Shaquille O’Neal. The words from O’Neal came after Montes threw three touchdowns in a 21-20 victory over Muir. The all-encompassing boys soccer and girls rankings that includes teams from the Whittier Daily News, Pasadena Star-News and San Gabriel Valley Tribune. 1. Montebello (16-1-3) – Keeps trucking along, 6-0 in the Almont League. 2. El Rancho (14-3-2) – Perfect 6-0 in the Del Rio League and getting better each week. 3. Baldwin Park (13-2-3) – One of most consistent winners over last decade. 4. La Mirada (14-4-3) – Had another big week, improved to 8-1 in the Surburban League. 5. Sierra Vista (13-1-3) – Has outscored opponents 50-7. 6. St. Francis (10-7-1) – In sole possession of third in super tough Mission League. 7. Damien (10-5-6) — Is hanging tough in Baseline League. 8. Diamond Ranch (13-5-2) – One game behind Chino for Hacienda League lead. 9. La Canada (9-2-4) – Closing in on Rio Hondo League title. 10. Santa Fe (11-5-1) – In sole possession of second place in Del Rio behind El Rancho. 1. La Mirada (18-2-3) — A real threat in Division 1 and undefeated in the Suburban. 2. Flintridge Prep (14-4-2) – On a roll, has won 10 straight. 3. South Hills (15-3-2) — Brutal 4-0 loss to Claremont, but still tops in Palomares League. 4. San Gabriel Mission (18-1-2) — Clearly the big favorite in Division 6. 5. Glendora (13-4-2) — Shocking 1-0 loss to Diamond Bar. 6. Flintridge Sacred Heart (8-8-4) – Improved to 3-1-1 in Mission League. 7. Bishop Amat (10-6-1) – Still leads the Del Rey League with one loss. 8. South Pasadena (14-3-1) — Moved to first in Rio Hondo League with win over San Marino. 9. Westridge (7-2-2) – Is second in Prep League. 10. La Canada (8-5-3) – Moved to second in Rio Hondo. The all-encompassing boys and girls basketball rankings that includes teams from the Whittier Daily News, Pasadena Star-News and San Gabriel Valley Tribune. 1. Pasadena (15-6) — Eight straight wins for the suddenly hot Bulldogs. 2. Damien (19-5) – Losses to Etiwanda and Chino Hills should knock it out of Open Division consideration. 3. Los Altos (20-3) — Undefeated in the Hacienda with challenge Wednesday at Charter Oak. 4. Muir (16-6) — What a race, tied with rival Pasadena for Pacific League lead at 8-1. 5. Bishop Amat (19-4) — Looking like it could be a real threat in the playoffs. 6. Cantwell Sacred Heart (16-7) – Obviously a good team struggling in a tough league. 7. Duarte (19-4) – Keeps on winning, 6-0 in the Montview League. 8. St. Paul (18-5) – Is 4-2 in Santa Fe after big win over Salesian. 9. Blair (17-6) – Beat La Canada to tie for the Rio Hondo League lead. 10. Charter Oak (15-6) — Beat Diamond Ranch to move into second-place tie in Hacienda. 1. Glendora (23-0) – Had a scare against Ayala, but still undisputed No. 1. 2. Keppel (21-3) – Perfect 6-0 in the Almont Leauge and threat in Division 2AA. 3. Sonora (20-2) — Cruising toward a Freeway League title. 4. La Canada (18-4) – Spartans are 6-0 and should go undefeated in the Rio Hondo League. 5. Rowland (15-3) – Has been playing as well as anyone since January. 6. Pasadena (17-7) — Won four straight since loss to Glendale. 7. Flintridge Prep (13-5) — Still perfect at 6-0 in the Prep League. 8. Los Altos (16-6) — Walnut loss leaves Conquerors tied for first in Hacienda. 9. Walnut (14-7) — Returns to the top ten after beating Los Altos to split season series. 10. Northview (17-6) — Strong season, only loss to Rowland in Valle Vista League. 1. Damien (19-3) – Routed Los Altos to take over the top spot. Hosts Etiwanda, No. 2 in Division 1 on Tuesday. 2. Los Altos (18-3) — Thoroughly dominated in big match-up against Damien; will rebound. 3. Pasadena (13-6) — Big win over rival Muir, now tied with Muir at 6-1 in the Pacific. 4. Cantwell Sacred Heart (16-5) – Struggling at 1-3 in the Del Rey, but obviously one of area’s best. 5. Muir (14-6) — Could be a dangerous team in Division 2A playoffs. 6. Bishop Amat (17-4) — Is 3-1 in the Camino Real and playing well for coach Brandon Ertyle. 7. Diamond Ranch (17-3) — Will take on Los Altos for first in Hacienda on Wednesday. 8. Duarte (17-4) – Area’s biggest surprise undefeated in the Montview League. 9. St. Paul (15-5) – Is 2-2 in the Santa Fe League. 10. La Canada (14-8) – Is undefeated in the Rio Hondo League at 4-0. 1. Glendora (21-0) – Could get tested for first time at Ayala for first in Palomares on Wednesday. 2. Keppel (19-3) – Undefeated in Almont League and No. 3 in Division 2AA. 3. Sonora (18-2) — On a roll and 4-0 in the Freeway League. 4. La Canada (16-4) – Undefeated in the Rio Hondo League at 4-0. 5. Rowland (13-3) – Getting healthy and looking like Raiders of past few years. 6. Pasadena (15-7) — Is 5-2 in the Pacific League. 7. Cantwell Sacred Heart (16-3) — Dropped first two games in tough Del Rey League. 8. Los Altos (14-5) — Has been hot, 4-0 in the Hacienda League. 9. Flintridge Prep (12-5) — Is 4-0 in the Prep League, but still has two games with Pasadena Poly. 10. Bishop Amat (13-8) — Is 2-1 in the Camino Real and No. 12 in Division 2AA rankings. 1. Montebello (14-1-3) – Ranked fourth in Division 2 and 4-0 in the Almont League. 2. El Rancho (12-3-2) – Ranked No. 21 overall in MaxPreps’ Southern Section rankings and 4-0 in Del Rio. 3. Baldwin Park (11-2-3) – Has won six straight and hasn’t lost since December. 4. La Mirada (11-4-3) – Four straight shutouts and 4-1 in the Suburban League. 5. Sierra Vista (10-1-3) – Has only allowed five goals all season. 7. St. Francis (9-6-1) – Is 3-2 in the Mission League, one of best league’s in SoCal. 8. California (10-4-2) – Back-to-back league losses to El Rancho, La Serna, then beat Whittier. 9. Diamond Ranch (11-5-2) – Is 3-1 in Hacienda, trailing undefeated Chino (4-0). 10. La Canada (7-2-4) – Tied with Monrovia for first in the Rio Hondo League. 1. South Hills (14-2-2) — No. 1 in Division 2 and ranked sixth in Southern Cal by MaxPreps. 2. La Mirada (16-2-3) — Already 7-0 in the Suburban, No. 8 in Division 1. 3. Flintridge Prep (13-4-2) – Ranked No. 2 in Division 3 and a real threat to win it all. 4. Glendora (12-3-2) — Finding its groove again after loss to South Hills. 5. San Gabriel Mission (14-1-2) — Reached title game last year and is No. 1 in Division 6. 6. Bishop Amat (8-5-1) – Has played well over last month and is 3-0 in the Del Rey League. 7. Flintridge Sacred Heart (6-3-4) – Is 1-1-1 in the tough Mission League. 8. Westridge (7-2-2) – Is third in competitive Prep League. 9. San Marino (8-2-2) – Has only allowed 11 goals all season and first in Rio Hondo League. 10. South Pasadena (13-3-1) — Lost to San Marino 1-0 in key Rio Hondo League showdown. When tournament organizer and San Dimas boys basketball coach Gordon Hamlow released the pairings for the annual Southern California Shootout showcase that will be played at Damien high on Saturday, there was instant thirst for that game that wasn’t on the schedule. In the final two games of the night, Damien was scheduled to play Corona del Mar and Los Altos would play Etiwanda. While those are great matchups, there was instant buzz on social media clamoring for a big area showdown of Damien taking on Los Altos instead. Hamlow made a few calls and everyone was agreeable with a switch, so the game is on. Damien (17-3), ranked No. 9 in Division 1, will take on Los Altos (17-2), ranked No. 1 in Division 2AA. Damien and Los Altos will play the final game of the night at 7:30 p.m., with Etiwanda taking on Corona del Mar at 6 p.m.
Los Altos’ 6-foot-3 junior point guard Jarod Lucas, who already has several offers that include Oregon State, Nevada, UC Irvine, Cal State Northridge, Boise State, UNLV, Santa Clara, Fresno State, Utah Valley, Montana, Tulane and others is excited about the game. On Wednesday, Lucas dropped 45 points with 11 rebounds in a 72-46 win over Walnut. Damien has a lot of depth headlined by Northern Arizona commit Cameron Shelton and Sacramento State commit Elijah McCullough. Locally, Los Altos is ranked No. 1 in the SGVN rankings with Damien No. 2. Glendora vs. Flintridge Prep, 9 a.m.
Rowland vs. Walnut, 10:30 a.m.
Riverside Poly vs. La Canada, 1:30 p.m.
Bonita vs. Charter Oak, 3 p.m. Colony vs. Diamond Bar, 4:30 p.m.
Etiwanda vs. Corona del Mar, 6 p.m.
Los Altos vs. Damien, 7:30 p.m.
Could Bonita be next stop after Steve Bogan resigns as football coach at Maranatha? Maranatha high school football coach Steve Bogan has resigned after four years and a 27-17-1 overall record at the school. In Bogan’s first year in 2014, he led Maranatha to the Olympic League title and an 11-1 overall record, losing in the second round of the playoffs, and taking the Minutemen to the second round again the following season. This past year, however, Maranatha was 6-5 and lost in the first round of the Division 9 playoffs to Aquinas, 44-3. 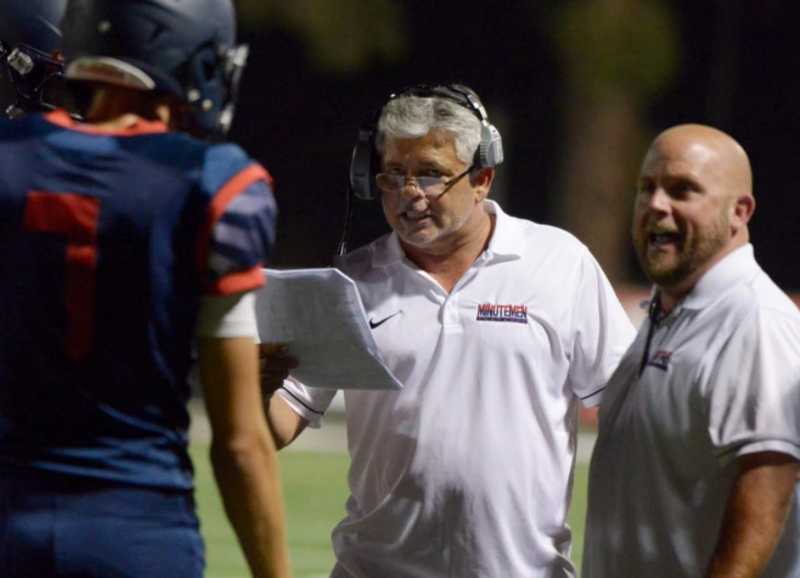 “Coach Bogan is a man of character, faith and commitment to his student athletes and it has been a pleasure to work alongside him,” Maranatha athletic director Sammy Skinner wrote in a statement. Bogan said he enjoyed his time at Maranatha, however the commute from his Walnut home was tiresome. Bogan was a longtime football coach and teacher at South Hills for more than 20 years prior to joining Maranatha. He resigned as football coach at South Hills in 2011 and while there led the Huskies to 13 league titles, four CIF Southern Section championships and a 32-12 playoff record. Bogan remained a teacher at South Hills after resigning in 2011 and coached the freshman football team for two years before taking the job at Maranatha. Retired from teaching full-time, Bogan is believed to be a candidate at Bonita, where he has reportedly met with school officials. Bonita recently parted ways with football coach Ibis Aguilar, and there appears to be mutual interest on both sides. Bogan said he would rather not comment at this time, though he did say he would be interested in coaching again if the situation is right. Bonita vice principal and former football coach Eric Podley said he wouldn’t comment on who has applied or who he has had conversations with about the position, only that candidates will be interviewed next week.